The University of Oregon's open-source TAU (Tuning and Analysis Utilities) package provides performance evaluation by profiling (reporting global statistics) and tracing (how events in parallel tasks interact in time) your code. Use TAU to gain insight into the performance and behaviour of your code: what routines take the most time, identifying load imbalances in a parallel run. TAU has some overlap in functionality with VTune. The difference lies in the fact that VTune can trace any binary, whereas TAU requires instrumentation. This means that TAU requires recompilation of your code, which may be cumbersome. On the other hand, TAU output is easier to understand since it relates to subroutine names in your code. Launch your new executable either interactively through an idev session or through a batch job. Use the "-tau:help" option after the compiler wrapper command to see useful TAU options. Behind the scenes, compiler wrappers create and execute a simple makefile that includes appropriate makefile options from an include makefile stored in the "$TAU_MAKEFILE" variable. Include makefiles are stored in the "$TACC_TAU_LIB" directory. The default "$TAU_MAKEFILE" value will provide normal MPI and hybrid (MPI/OpenMP) instrumentation. Set the variable to "$TACC_TAU_LIB/Makefile.tau-intelomp-icpc-papi-ompt-pdt-openmp" for pure OpenMP codes. TAU_PROFILE Set to 1 to turn on profiling (statistics) information. PROFILEDIR Set to the name of a directory; otherwise output goes to the current directory. 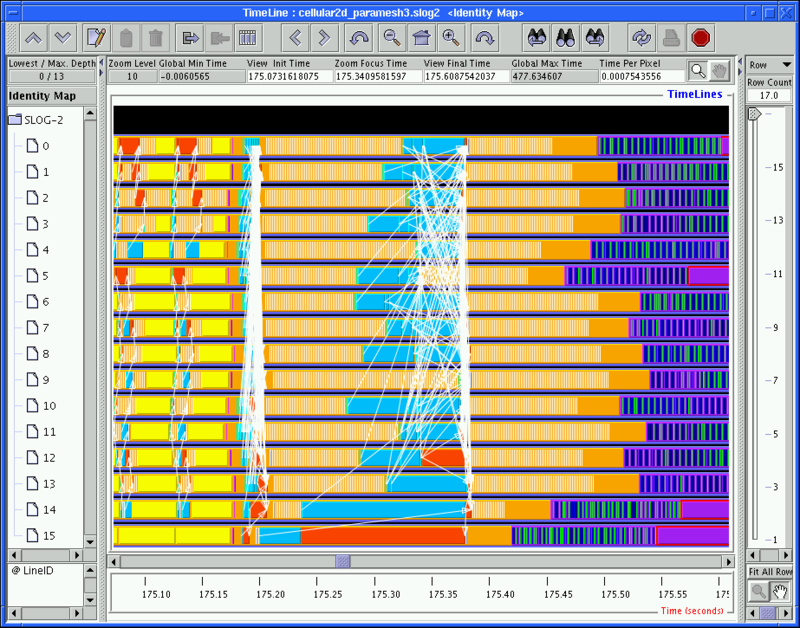 TAU_TRACE Set to 1 to turn on tracing (timeline) information. TRACEDIR Set to the name of a directory. You can safely use the `PROFILEDIR` value. Then run your program as normal. Once execution finishes, you can process and examine the TAU profile and/or tracing output. After your program runs you can process TAU's output to do two things: view statistics and analyze trace data. The TAU package includes two visualization tools, ParaProf, and Jumpshot. See Remote Desktop Access at TACC for instructions on setting up visual connections to TACC resources.